One of the cornerstones of instrumental jazz-rock, Return To Forever were formed in the early 70s by ex-Miles Davis keyboard player Chick Corea and bassist-extraordinaire Stanley Clarke. After a couple of albums the pair were joined by guitarist Bill Connors and drummer Lenny White to record the legendary ‘Hymn Of The Seventh Galaxy’ in 1973, with Connors replaced by 19 year old guitar prodigy Al DiMeola the following year. ‘Where Have I Known You Before’, ‘No Mystery’ and the bestselling ‘Romantic Warrior’ followed, showcasing an increasingly progressive and accessible side to the four accomplished instrumentalists. DiMeola departed in 1976 and stalled the band’s popularity, disbanding after one more eclectic release. For over thirty years Corea shunned suggestions of a reformation in favour of a prolific solo career, and with DiMeola and Clarke both having success on their own it would be 2008 before they finally started a much requested world tour. The ensuing 'Returns' live DVD and CD was impressive enough but the lengthy set was a little bogged down by extended solo spots, so with DiMeola once again out of the picture Corea has drafted in renowned guitarist Frank Gambale as well as French violin maestro Jean-Luc Ponty. Over two CD’s and a DVD, the line-up now christened ‘RTF IV’ have rearranged some of their best pieces and added some solo tunes, creating an album that really sparkles, even without the influential DiMeola. The addition of Ponty in particular gives some of the material a style not too dissimilar from the instrumental parts of early Kansas or Dixie Dregs, with highlights aplenty on extended classics like ‘Senor Mouse’, ‘The Shadow Of Lo/Sorceress’ and ‘After The Cosmic Rain’. The playing is phenomenal and the sound is among the best I’ve ever heard for a live album, with the welcome additions of Ponty’s own ‘Renaissance’, the beautiful acoustics of ‘The Romantic Warrior’ and Clarke’s best-known solo song ‘School Days’ helping to mix things up. Only the brilliant opener ‘Medieval Overture’, the merging of Corea’s ‘Concierto De Aranjuez’ with the classic ‘Spain,’ and the closing ‘Beyond The Seventh Galaxy’ clock in at less than ten minutes, with all the others featuring inspired solos from all the instrumentalists within the structure of the songs rather than noodling on their own. Gambale rises to the formidable task of making sure that DiMeola isn’t missed, his precise and tuneful playing giving a different slant to material originally showcasing his two influential predecessors. The accompanying DVD, whilst being perfectly presented, also has an annoying side to it. There’s a lengthy ‘Behind The Music' documentary which is both highly entertaining and informative, and the chemistry and banter during the interviews shows that there’s enormous respect and friendship between the musicians. 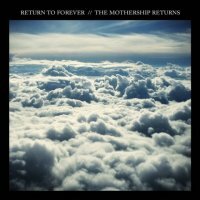 ‘The Story Of Return To Forever’ is an eight minute trailer that seems to preview a different documentary, and the annoying part is that there’s excellent live footage of just ‘After The Cosmic Rain’ and ‘The Romantic Warrior’, even though the documentary clips suggest that the whole set was recorded. Apart from that this is a perfect representation of one of the most talented bands ever to grace a stage. Now, how about some UK dates with this line-up?